The Kaiser Chiefs are an English Pop band from Leeds, formed early in 1997 under the moniker Parva. After reinventing themselves as the Kaiser Chiefs in 2003 the band made a strong impact on the British music scene, culminating in winning three Brit Awards for 'Best Group', 'Best British Rock Act' and 'Best Live Act' in 2006. Prior to 2003 the members of the band had been a garage rock group called Parva (before that having been known as Runston Parva). However, after being dropped by their label, the band went back to their roots and adopted a more britpop sound, helping the band reach their current popularity within the UK and beyond. Members of the band are ardent fans of the English football team Leeds United. The band was named after the South African Kaizer Chiefs Football Club, the former team of long-serving former Leeds captain Lucas Radebe. 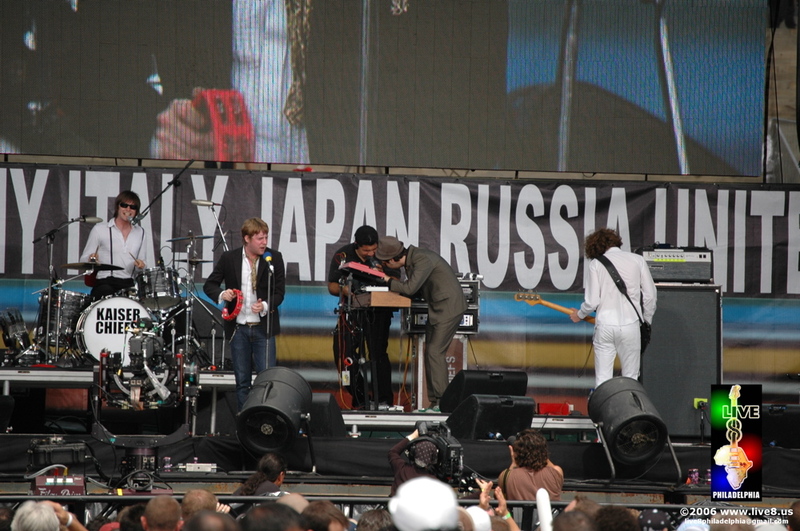 On 18 February 2005 the Kaiser Chiefs were the opening act at the NME Awards show and won the Philip Hall Radar Award. Their debut single, 'Oh My God' was released on Drowned In Sound Records in May 2004. It sold out within three days of going on release and charted at #66 on the UK Singles Charts. A new recording of 'Oh My God' was released on 21 February, which charted at #6. The debut album Employment was released on 7 March 2005 and entered the charts at #3 that week. Despite becoming favourite after being shortlisted, the album failed to win the 2005 Mercury Music Prize. A DVD release, entitled Enjoyment, was released in November 2005. The basis of the DVD is a (semi-false) documentary about the band narrated by Bill Nighy. It also includes all the promo videos, live performances and more. An internet-only (so far) music video for their song "Sink that Ship" has been released in September 2005. The video appears on Electronic Arts' website as a promotional tool for their game Burnout Revenge but is completely unbranded. Wilson auctioned off his red tambourine to radio show Xfm in late 2005 to raise money for the homeless charity Shelter. The winning bid was £375.00. He is now auctioning his boots on ebay. 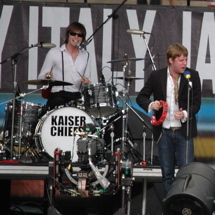 Kaiser Chiefs' first big festival show was at the dual-site Reading and Leeds Festival on 27 August 2004 and in the following year, on 16 May 2005, they appeared at the Pinkpop Festival in Landgraaf, Holland. After that, things went fast. They were the opening act at the Philadelphia Live 8 concert on 2 July 2005, one of only two British acts in the lineup (Def Leppard being the other). They performed "I Predict a Riot", "Everyday I Love You Less and Less" and "Oh My God". June 2005 saw them headline at the May Ball at Queens' College, Cambridge, before an acclaimed appearance at a rainsoaked Glastonbury Festival during the same month, whilst August's appearance at the V Festival featured a very enthusiastic set despite Ricky Wilson having his leg in plaster. Also more recently they embarked on their own headline UK Tour, supported by Maximo Park and The Cribs. Their first US tour (with The Cribs) ran through the summer of 2005, and they followed it by playing a few shows on the Foozer tour. This was followed up by opening for Foo Fighters during their Australian tour in December 2005. They also played to Jools Holland and his audience on December 31, 2005. 2006 will be a year with not too many performances, as the band starts to record their new album in August. March 1, the band played their biggest concert ever, in the Heineken Music Hall in Amsterdam, Holland, performing for a more than 5.500 crowd. This show was a part of their Europe tour in February and March. In April there will be several shows in the UK, followed by a few festivals in June and July, like Pinkpop, Rock Am Ring and Rock Werchter.